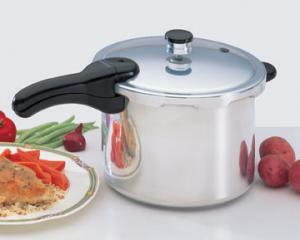 Presto(r) Pressure Cookers are the ideal cooking tool for today's busy lifestyle. Meals cook to perfection in minutes-three to ten times faster than ordinary cooking methods. Make delicious soup, risotto, chicken, stew, fish, and vegetables. Lean meats cook up fork tender and juicy every time. Durable polished aluminum for quick, even heating and easy cleaning. Includes cooking rack and complete instruction/recipe book.